The Hudson Horror Show 8 in Poughkeepsie, NY is a film festival featuring 5 classic horror/sci-fi/exploitation films in rare 35mm. November 16th 2013. 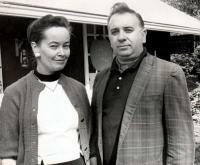 Ed Warren and Lorraine Warren were paranormal investigators involved in many cases including Amityville and the Perron case, a subject of the recent movie The Conjuring. Contamination is Luigi Cozzi’s gory alien clone from 1980 featuring exploding people, cyclops monsters, and Ian McCulloch. A look at 1980’s Prom Night, the post-Halloween slasher again starring scream queen Jamie Lee Curtis.